Released by Stratford District Council on 24 February 2009 - Councillors have set the district element of the council tax in the Stratford-on-Avon District, following a full meeting of the Council yesterday, Monday 23 February. The average Band D figure for Stratford-on-Avon District Council households for the 2009/10 financial year will be £127.43 an increase of 3.5% the lowest in Warwickshire - this increase equals 8.3p a week from this year's figure of £123.12. This means that all the services provided by the District Council are only costing £2.45 per week for a Band D household. The Joint Parish Council is proposing a 34% increase in its Council Tax according to Stratford District Council. Warwickshire County Council has published a 3.89% council tax increase for 2009/10. The Press recently reported a District Council tax increase of 4.9% but your District Councillors’ promised to work to get it lower and we’ve done just that. At Full Council on Monday 23rd February we set Council Tax at 3.5%; that means that all of the services provided by your District Council are only costing £ 2-45 per week for a Band D household and we remain the lowest in Warwickshire by a long way! At Full Council it was also agreed that the two Area Planning Committees (East & West) be replaced by a single Planning Committee. 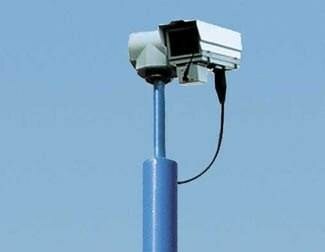 The recommendation was supported for a trial period of 12 months and it is anticipated that efficiency savings of around £28,000 will be achieved as a result. As Chairman of West Area Planning I was particularly interested in this item and, although I do have some reservations, on balance I believe that we have to identify and seize opportunities to make savings now or we’ll all suffer later. Members Basic and Special Responsibility Allowances, a view supported by all Conservative Members of the Council. Just a reminder that we have the West Joint Committee meeting next Thursday 12th March in the Main Hall at Alcester High School and Technology College, Gerard Road, Alcester, B49 6QQ. 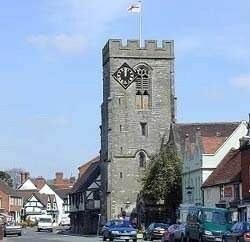 Beaudesert & Henley in Arden Joint Parish Councils Grant Application for work on the Market Cross goes before the committee and will be supported by both me, Stephen Thirlwell and our County Councillor George Atkinson. Over the next few days all households will receive their quarterly copy of the In Touch Newsletter which is delivered free to nearly every household in Wootton Wawen, Beaudesert & Henley in Arden. The long awaited plan for the Market Cross redevelopment was unveiled at a recent meeting of the parish council. We hope to bring you further information in a future issue. The original idea was conceived by Ray Holding, curator of the Heritage Centre, whose sketch appears above. 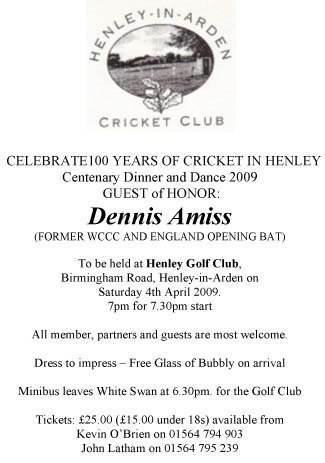 As a regular user of the Memorial Hall as a member of the Henley in Arden Drama Society, I, more than most, appreciate just what a wonderful gift it is to have such a facility within the bounds of the town. 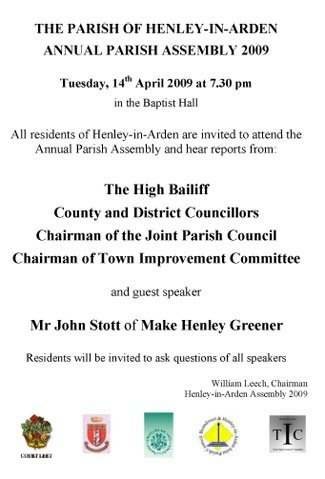 Indeed without the Hall, amateur theatre in Henley would not exist, or would have to be conducted ‘out-of-town’ – some might say a preferable option! 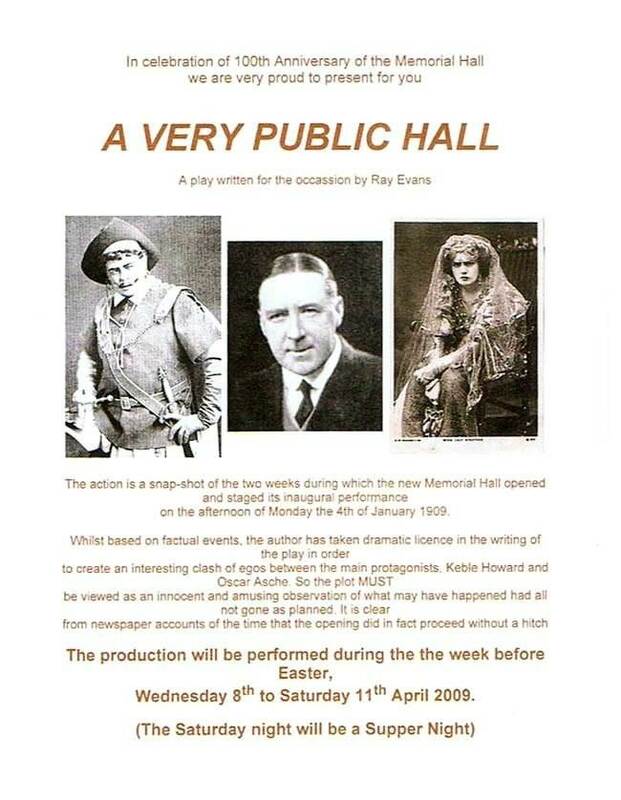 So I was moved to record the Hall’s one hundredth anniversary by writing a play based on the week or so leading up to the formal opening, on the 31st December 1908 and, more especially, the inaugural theatrical performance on the afternoon of Monday the 4th of January 1909. When I began to research the subject, it became clear that I was unearthing a ‘cultural’ revolution in terms of the impact on such a small Warwickshire market town. Perhaps the most breathtaking event of the theatrical afternoon was that the “Posh & Becks” of the period agreed to open the Hall with an excerpt from their long running and highly successful production of Taming of the Shrew at His Majesty’s Theatre, London. No less than Mr Oscar Asche and Miss Lily Brayton. Hot on their heels, another luminary of the time, Mr Keble Howard a very successful author-playwright, agreed to stage his current comedy, Compromising Martha, fresh from the stage of the Haymarket Theatre, London, at the same event. Competition was made all the more fierce by the fact that Keble Howard aka John Keble Bell, was born in Henley, one of twelve children of Mrs and the Reverend George Edward Bell, incumbent at St John’s in Henley from 1876 to 1914. Finally, keeping the ‘professionals’ on their toes, our very own, newly formed Henley Drama & Operatic Society, entered the arena with their rendition of Trial by Jury, by kind permission of Mrs D’Oyly Carte. So, it must have caused some anxiety to Dr Ernest Nelson, the man who’s inspiration and driving force, had lead to the opening of the Hall, when he had to choose the bill running order. His final choice is what makes the play so intriguing - To be continued. Ray Evans - www.hads.org.uk for more information about the play. 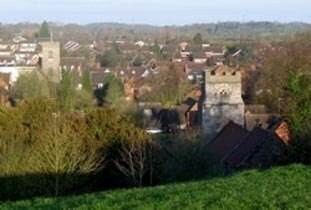 Air quality in South Warwickshire is generally good but detailed assessments across the area have shown that a number of small areas in Stratford and one in Henley-in-Arden are not meeting national standards set under the Environment Act 1995. 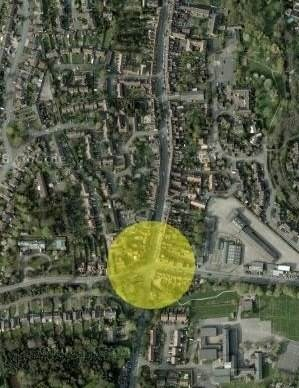 Stratford District Council has exclusively revealed to Henley NEWS On-line that the area in Henley is around the Warwick Road traffic lights. Air quality has been monitored continuously for the past eight years at 27 different locations across the council’s area and the results showed that the levels of nitrogen dioxide at 5 of those locations were likely to exceed the accepted annual average level. Subsequent detailed assessments confirmed queuing traffic and congestion to be the causes of the localised elevated levels observed at those so-called air quality hotspots. Nitrogen dioxide, a gas produced primarily by combustion processes, is known to increase the risk of respiratory infections and to aggravate conditions such as asthma, though not to cause them. Car queuing and congestion at these hotspots in Stratford town and Henley-in-Arden have been highlighted as the problem by Stratford-on-Avon District Council’s environmental health officers who monitor air quality across the District. The AQMAs are set up in response to a fall in quality of air in these locations; the District Council’s next form of action is to consult with the public and town/parish councils following which remedial action specific to the needs of the area will be planned and carried out. Proactive action on matters such as air quality is important as in this case the pollutant, nitrogen dioxide, is an aggravator (but not the cause) of respiratory conditions such as asthma. The public will be kept informed at every stage of the process. 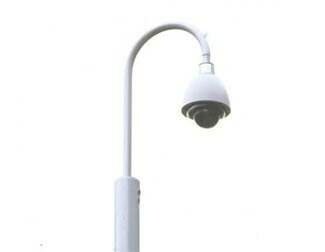 Details will be publicised using local media and can be found at www.stratford.gov.uk over the next few weeks. A superb Chinese supper at Sans Restaurant was enjoyed by 67 people on the evening of Tuesday, 24 March in the year of the Buffalo. The sell-out event was arranged by the Guild Hall Garden Committee and the supper was laid on by Tom and his excellent staff. The evening went with a swing from the start, with John Latham acting as Master of Ceremonies. The last diner left standing at the opening Heads and Tails event collected a bottle of malt whisky and a raffle was organised by Marion Brealey and Marijana Bainbridge. Members of the committee put up their talents for auction in a variety of fields of expertise and some healthy bidding ensued. The evening raised £1,200 for the Garden Project and a good time was had by all. The next event will be an Indian supper on a date in September yet to be fixed. Subject to the final (we hope) clearance from Stratford District Council on the remaining three of the fifteen conditions imposed on our planning consent it is intended that work on the Riverland Garden will start next month. I have only one question "Why"? I suppose that somewhere in the world there is a Mr Norton Lindsey and a Mr Moreton Morrell. There may well be brothers called Danzey and Pinley Green but it certainly came as a surprise to meet a Mr Preston Baggott this week when we were drawn to play together in a local golf tournament on Grand Bahama island. He had heard tell of a Warwickshire hamlet of the same name and feels that he ought to pay a visit and explore the possibility of levying some ancient taxes on the residents as he may well be the long lost Lord of the Manor. I explained that in addition to some of Warwickshire’s finest homes being located there, the village also has the famous Crab Mill as its social hub. 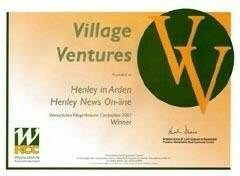 He has promised to give Henley News On-line due notice if he decides to visit so that residents of Preston Bagot may be prepared. Andrew Hirst described Alan Winterburn's talk ‘Little Known Warwickshire’ as a ‘cornucopia of information’ during his vote of thanks at the Henley and Beaudesert Society meeting in February. A very full hall enjoyed the fund of facts packed into the talk together with slides illustrating related places. And then she brewed the servants’ beer. The latter came last because it was watered down. It was given to workers in the fields especially at harvest time. 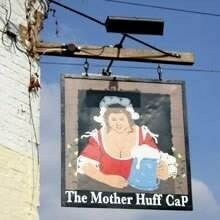 This is the origin of the expression ‘small beer’ for anything that is inferior. Near Kenilworth castle is a group of properties known as Little Virginia. The name arose 400 years ago when potatoes were first brought from America. This location was the only place in Britain where the first plantings grew successfully. People guessed that the soil had similar properties to that in Virginia and thus, the new name. Finally, one Nicholas Brome, the owner of Baddesley Clinton in the late 1400s, committed two murders. For the first he received a heavy fine due to extenuating circumstances. For the second he eventually received a pardon from the Pope, his penance being to spend money on churches. He installed a new bell tower at Baddesley at a cost of £400 (probably millions in today’s money), raised the whole church by 10 feet and installed 3 new bells. 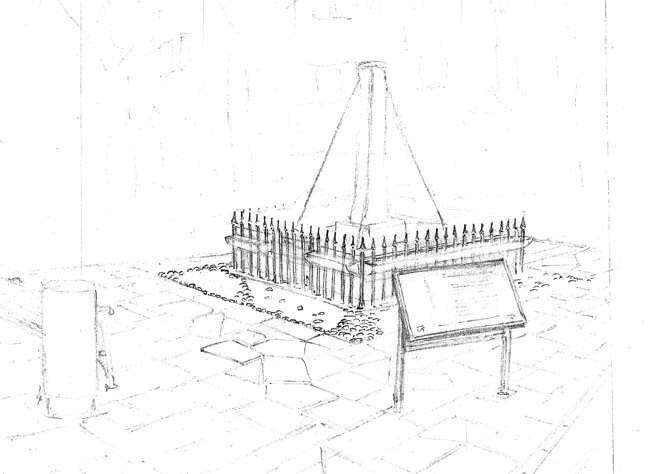 As a final act of penance he left instructions that he be buried upright under the entrance of his new tower so that everyone entering the church would walk on his head. Convivial chat over coffee, tea and biscuits followed as usual. 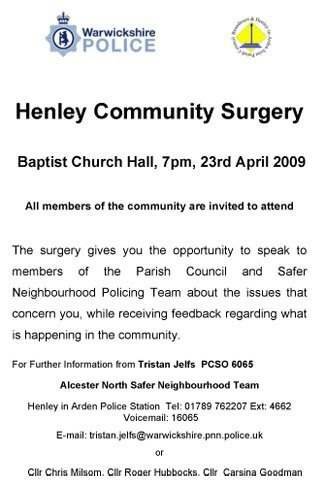 The next meeting is on 19th March at the Baptist Church hall. 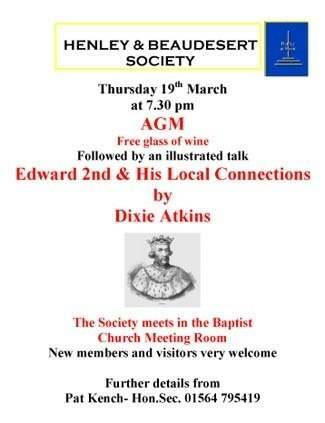 It starts at 7:30 with the AGM followed at about 8pm by a talk by Dixie Atkins on ‘Edward 2nd & his Local Connections’. Visitors most welcome (£3). I refer of course to the end of the payroll year. Not only is 5th April the end of the tax year it’s also the time when employers should file their payroll returns for the year to date. This means that for monthly paid employees the March payment is the last one of the current year. So let’s look at what you, the employer, need to do. By now you should have received an Employer Pack from Her Majesty’s Customs and Excise (HMRC) which contains an Employer Bulletin, a CD and information on how to order the forms you may need. If you use payroll software you should shortly be getting an update from your provider. HMRC encourages businesses to file their Employer Annual Return (forms P35 and P14) on line, and indeed companies with more than 50 employees have to do so. Employers with less than 50 employees will get a £75 rebate if they file on line, but this is the last year such a rebate will be given. Employers with more than 50 employees will get clobbered for a £3,000 penalty if they don’t file on line. Check you have made all the necessary changes to your employees' tax codes for 2009-10. Ensure you begin using the new Taxable Pay Tables for any further salary payments. If you have a computerised payroll make sure you have implemented the updates. Make sure you have made your final PAYE and NIC payments to the tax office. If you pay electronically you have till 22nd April. This is the last date for your forms P14 and P35 to reach the tax office or for you to file on line. This is the last date for giving the 2008-09 P60 form to each employee who was working for you at 5 April 2009. There are of course penalties for failing to meet this timetable. Well there’s a surprise! Whatever you do, don’t be late with your final payment as HMRC will impose a penalty and don’t leave it till the last minute to file on line in case their system crashes and you can’t get it done in time (this has happened). Apart from that, it’s really quite easy! Download a FREE copy of the Small Business Guide to Employment 2008 (valid until the end of this month). Christians from the Churches of Henley and Ullenhall start a five week Lent study course on 5th March. We will study some basic areas of Christian belief such as Faith, Hope and Love. Views of a number of well known Christian Leaders will be heard on this course which will be held across the UK and shared by all sections of the Christian Church. These Thursday evening sessions will be in the Methodist Church Hall and start at 7.30pm. All are welcome to join in, share refreshments, meet new friends and learn about the Christian faith. St. John’s Lent Appeal will again be in support of a local Leamington based charity CORD (Christian Outreach Relief and Development). Focus this year is on four refugee camps in Eastern Chad where CORD have been working since 2004. Our challenge this Lent is to help CORD train more teachers and provide more shelters and books for their two education programmes serving 35,000 children. Refugees are trained to become teachers ensuring education is culturally relevant and giving them a long term skill when they return home. Some idea of costs are £750 for a classroom shelter, £230 trains a teacher, £20 buys a blackboard and a year’s worth of chalk and £15 supplies a class with a geometry set each. Please do consider making a donation to this worthy cause. Donations can be returned to St. Johns church directly or via the Rectory. For more information please contact a member of the Missions and Charities Group on 797949 or 792439. Thank you. Friday 6th March 2.00 pm at Our Lady and St Benedicts Church, Wootton Wawen. The speaker is Betty Fleetwood. Sunday services, all at 11.00 am are: 1st – Mr. Alan Cooper; 8th – Revd. Robert J. Powell (Sacrament); 15th – Miss Paddy Beardsall; 22nd – Mike and Lesley Sergeant (Mother’s Day); 29th – Mr. John Parkes. 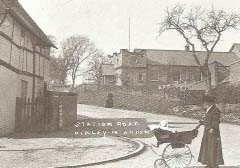 The Baby Group meet every Monday at the Methodist Church from 10.30 am. as Claverdon Put Title Back In their Own Hands. 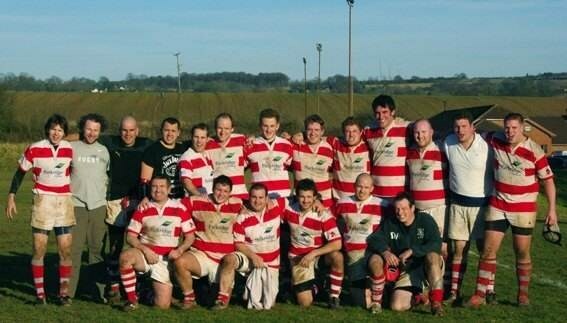 Claverdon first XV, pictured right, made the long journey to Bromyard last Saturday aiming to put the previous week's unfortunate defeat behind them. It was a warm, sunny day - ideal rugby conditions for arguably the two best running sides in the league. Claverdon also had the luxury of boasting one of their strongest squads of the season to date. Visser replaced Paul Carruthers at number 8, while Thompson, Marsh and club legend Ariss, made up an exceptionally strong bench for the visitors. Vice President's day for the home side and Claverdon's travelling support fuelled the atmosphere for a potentially explosive clash. Both teams started positively, looking to spread the ball across the wide pitch at every available opportunity. Positive running from backs Horswill, Gray and Barton was met by a staunch Bromyard defence. Equally Claverdon's defence, the best in the league, held up amid some strong running from Bromyard's back row and centre partnership. One area where Claverdon dominated from the start was the scrum. Led by the engine room of Joyce and Skinner and marshalled in the front row by Carruthers, the Claverdon scrum has gone from strength to strength in recent weeks. Credit must be paid to the off the field work carried out by Thorndale and Dolman, alongside coach Wood, who have helped the pack develop during training sessions this season. After an even opening fifteen minutes, in which Bromyard missed two penalty kicks, Claverdon began to edge in front on the territory side, with their pack providing a good platform via the lineout as well as their dominance in the scrum. The first score of the game came from a breakdown ten metres from the Bromyard line. Brannon, Carruthers and Johnson were quick to the breakdown ensuring Wyllie a quick ball. He in turn fed Horswill who was able to release Westmacott at pace to beat three Bromyard players to score under the posts. Barton converted, 7-0 to Claverdon. Bromyard, who also hold title aspirations, weren't about to allow this to dampen their day and within minutes were level as they showed what they could do with ball in hand. 7-7. The free flowing running rugby continued and any Bromyard or neutral spectators would have been overjoyed as Bromyard produced a 20 minute period of dominance which saw them score two further tries, almost instantly from kick offs, as they used their knowledge of the pitch to their advantage whilst capitalising on Claverdon's inability to react to almost carbon copy moves. Within five minutes of the second half a stunned Claverdon team were 22-7 down and had failed to piece together any period of unbroken play for almost 20 minutes. The only positive within this last period was a sublime break from Barton, who made a trademark run down the wing, beating three men to almost score in the corner. In a bid to add fresh impetus to their fast disappearing league title hopes, Ariss and Thompson replaced Thorndale and Lowe respectively. Both had had solid games but Claverdon needed something to lift the side. Enter Ariss in his familiar role as flanker. As always solid in the tackle and within minutes he had secured and turned over the ball for the visitors on three separate occasions and what a difference it made. Claverdon with ball in hand were now as dominant, perhaps more so than Bromyard had been. From a Claverdon scrum in centre of pitch, their backs split up across the pitch. Visser picked up from 8 and passed to Wyllie who timed a good pass to Westmacott. He made a good fifteen metres before drawing his man and off loading to Dawes who scored in the corner. The conversion was missed, 22-12. Claverdon were now firing and it was not just Bromyard, but the time they now needed to beat. This Claverdon score had visibly rocked Bromyard and it was no surprise to see Claverdon remain in the ascendancy. Within a ten minute period two moments of individual brilliance, yet diverse in running styles, put Claverdon into the lead. Firstly a jinking run followed by a chip, with complete awareness, from Daws made it 22-17 and secondly, a powerful, aggressive run from Johnson made it 22-22. Barton, calmly added the conversion to put Claverdon into the lead, 24-22. Bromyard were now a beaten side and so rarely has the pendulum swung so much from one side to the other in a game. Claverdon now looked like scoring with every break they made. Ariss took a tap penalty from 5 metres out and scored only for the referee to call it back. The Claverdon forwards led by Ariss were now as dominant in open play as they had been all afternoon in set piece and Joyce and Edsall, so often the unsung heroes were at the forefront of most attacks. After two excellent forward phases out on the left Horswill fed Johnson, via Visser and Gray on route, who found Daws who scored his third try of the match in the corner. The conversion was missed. 29-22 to Claverdon. Claverdon almost claimed a push over try in the closing stages of the game that would have been no more than the pack deserved but Bromyard showed why they are where they are in the league and held out to deny Claverdon. This win puts the league title back in Claverdon's own hands and this coming Saturday sees them take on 3rd place Birmingham Exiles, while leaders Chaddesley Corbett travel to 4th place Bromyard. A French vessel with 1000 tons of asbestos and toxic waste refused by Egypt and India is on its way to, guess where? You're right - Britain, to berth in a place where already there are many cases of cancer and chest complaints concerning children. This vessel, which France is glad to be rid of, will take eight weeks to pump out before it can be broken up and recycled for a few million pounds to provide jobs for men who cannot afford to be choosey. JOBS, that emotive word which apparently means we in England are prepared to soil our own nest and risk our children's lives for a few bob from a company called Able UK. Presumably this does not apply to the rest of the world which is just as hard up, but not that hard up! As if this was not enough to stomach there are already seven ships lined up and waiting for the same treatment (probably those sent here by the Americans a couple of years ago when no-one else would have them). Are we so down-trodden that we need to do this to scratch a living or so consumed with our own expertise that we think no-one else is capable of taking on this dangerous and disgusting work in order to earn a decent living! I guess by the time this repulsive stuff has settled into our green and pleasant land a few wide boys will come along and build houses on it. Not content with those headlines, apparently, our Home Secretary is also making the most of our very generous handouts: £24,000 is a tidy sum for maintaining a second home, except in this case it is the main home, or to pay the childrens' school fees. Why not utilise all those new blocks of unused office space and turn them into comfortable 2/3 and 4 bedroom flats for MPs who need a pad for the purpose of a few days 'surgery'? They could be charged a reasonable rent to go towards maintaining the building and if the property became vacant after an election it could be offered to a successor. It would be a lot cheaper, the building would remain the property of the State and offer no excuse for the need of a second home which, by then, would probably be worth a fortune to its highly subsidised owner. Kenilworth Initiative on Climate Change (KICC) held an open meeting on Thursday 22nd January. This well attended meeting began with a presentation by George Martin who gave an overview of why action was needed. Attendees to the meeting were asked to prioritise the group's actions for the coming year. The majority of attendees felt that thermal imaging, low carbon building information and communication activities should be amongst the first priorities. During the meeting George Martin was appointed Vice Chair and Roger Bennett Treasurer. The finals of Universally Challenged were to be held on Tuesday, February the 10th, at the University of Warwick. Warwickshire's Kenilworth School will be competing against Stoke Park School, Coventry and Chantry High School, Worcestershire in this sustainability based quiz. The quiz will consist of six rounds including the 3Rs, biodiversity adaptation picture round, wasteful school picture round, sustainability questions, fair trade game and funny fotos. The winning school will be awarded the Universally Challenged Trophy. The event had to be cancelled because of the snow - but watch this space for a new date. Replacing the Hall boiler with an energy efficient condensing combi boiler. The National Association of Cider Makers (NACM) has launched a report on the impact of climate change on the cider industry. The report "A Changing Climate for Cider" was developed with the support of UKCIP. The NACM took a 30 year view of potential impacts on orchards, production and the market place. Challenges for the industry may include: summer drought leading to tree stress, leaf drop, smaller fruit size and poor quality juice and prolonged wet winters giving rise to root loss. To see the rest of the newsletter click here. Visit the Homepage of the Warwickshire Climate Change Partnership, where lots of interesting information can be found. Have you received an unexpected email from Western Union about transferring $100,000.00 to your bank account? If so Warwickshire Trading Standards Service is warning you to be wary of this latest phishing email. During the last week Trading Standards officers have received a number of complaints about an email which claims that “Western Union Money Transfer” is trying to deposit $100,000.00 from the International Monetary fund into people’s bank accounts. The email goes on to claim that Western Union is unable to complete a money transfer without additional personal information. The email is sent from an email address which implies that the sender is Western Union, the legitimate money transfer company, but it is in fact a hoax address. Warwickshire Trading Standards Service monitors and evaluates phishing emails, postal and telephone scams received from the public. The service liaises with the Office of Fair Trading (OFT) to try and identify, source and stop the scams. Bananas symbolise the challenges in international trade. One in 4 bananas sold in the UK is now Fairtrade. The objective of Fairtrade campaigners is to increase that to 50% by 2012. Help to celebrate the success so far and keep up the campaign by joining thousands of people worldwide in setting a world record for the largest number of Fairtrade bananas eaten over a 24 hour period. Join us outside St. John’s on Saturday 7th March 10.00 am to 12.00 noon to play your part. Supplies of Fairtrade bananas will be available but you can also purchase your own that week from Henley Somerfield. There will also be a Tradecraft stall and information on Fairtrade issues. Joanna Oldfield is the speaker at our meeting on Tuesday 3rd March and visitors are welcome to join us to hear about “Diabetes and the Work of Diabetes UK”. We meet in the Memorial Hall from 7.30 pm on the first Tuesday each month and have groups meeting through the month for members to take part in play reading, patchwork, short walks or 5 mile walks, cross stitch and social gatherings. For details please telephone 792519 or 793640. 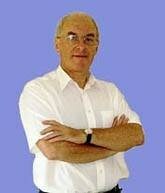 We meet on Tuesday 10th March, 7.30 pm at the Memorial Hall when our speaker is Mr. Lee Berrill “Let’s be Different”. Competition “Blown Away”. Thursday 19th March, 8.00 pm Baptist Church Hall. Our speaker is Dixie Atkins on “Edward 2nd and his Local Connections”. Visitors and new members are very welcome. Further details from Pat Kench on 795419. Next meeting is on Tuesday 17th March when Rosemary Morris will entertain us with “A Year in the life of Two Photographers”. Visitors are welcome to join us in the Baptist Church Hall from 7.45 pm – only £2. Tuesday 24th March at 7.45 pm in Ullenhall Village Hall. Our AGM with Cheese and Wine and “Something Else”. We also have a day visit booked for RHS Malvern Spring Garden Show by coach with pickup points in Henley and Ullenhall. Cost including coach and admission is only £24. If you are interested please contact Diane on 01789 488209. Tanworth Village Hall Saturday 28th March at 8.00 pm. Join the Tanworth Singers for a concert of light music and readings. 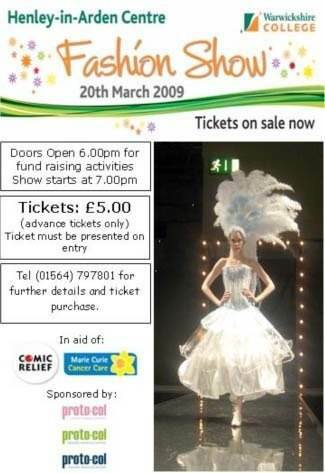 Tickets £7 will be on sale in The Bell on Monday 9th March from 10.00 am. For availability after that date telephone Judith Allen on 01527 550499. Meetings are held on the first Wednesday of the month in the Parish Hall, Beaudesert Lane at 2.15 pm. The Club has around 80 members and organises a varied programme together with various outings. If you are interested in joining, please contact Gordon Trinder. Henley Cricket Club fields two teams in the Cotswold Hills League on a Saturday, and two teams in friendly fixtures on Sundays, from mid-April to mid-September. We are always on the lookout for new players, irrespective of age or ability. Anyone interested in joining our club should contact Kevin O'Brien on 01564 794903. 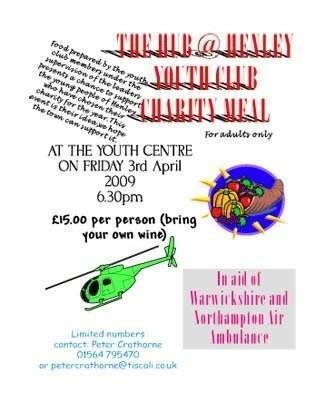 The Warwickshire Rural Community Council (WRCC) helps and encourages people living in rural areas to develop their communities. By aiding locally led and run projects they also hope to strengthen social ties within Warwickshire's villages and small towns.